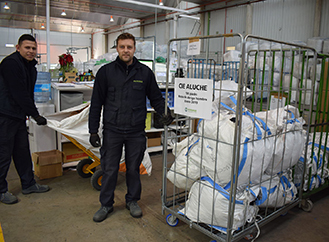 Humana has delivered today, January 31, a hundred packs of winter clothing for inmates of the Foreigners Internment Center of Madrid (CIE de Aluche). This donation includes several hundred garments for men (jackets, coats, pants, sweaters, shirts...) "Most people come from tickets by boat and logically lack resources," they explain from the CIE itself, "hence the need to have adequate clothes to the low temperatures of winter ". The garments come from the preparation plant for the reuse of Humana in Leganés (Madrid), where the used textile from the donations of the central zone of Spain is processed. It is about clothes in good condition that the citizenship has previously deposited and in solidarity in the containers of the Foundation. A few days ago the organization received a request from the Foreigners' Internment Center and from the first moment decided to join again this request of Manager of the CIE, in order to help people who have fewer resources. This is the third donation of clothes made by the Foundation for the CIE of Aluche. The first goes back to the winter of two years ago, also so that the inmates of the center could alleviate the rigors of the cold by the lack of outerwear. The second was a few months later, in June of 2017, and the third this same week. The social purpose of used clothing is precisely this: to help those who have less. 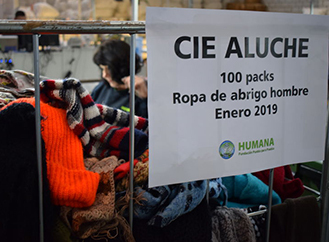 Humana acts when an emergency situation occurs outside our borders and of course also meets requirements such as the Aluche CIE.